With your support, Headquarters provides suicide prevention counseling, education, and resources to the entire state of Kansas and beyond. We are the home of both Headquarters Counseling Center and the Kansas Suicide Prevention Resource Center. 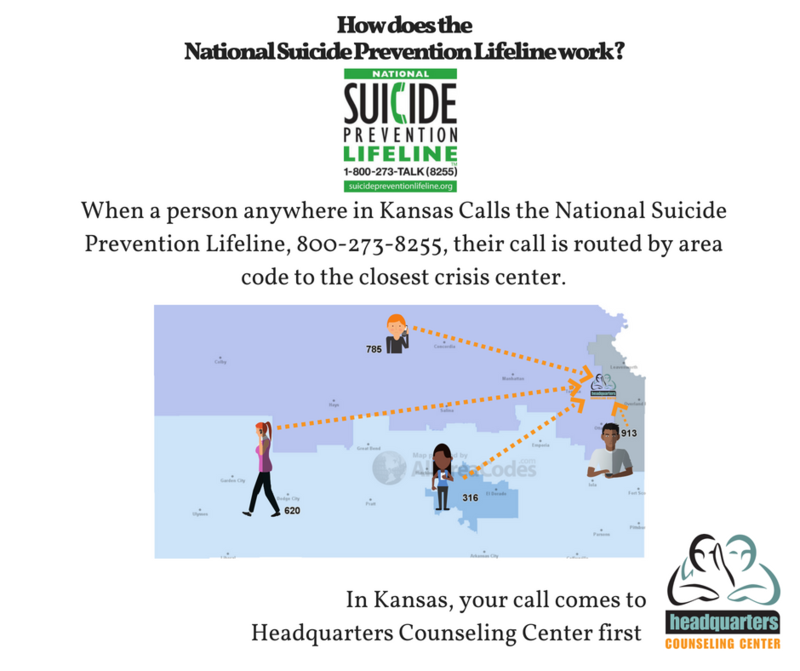 We are the only National Suicide Prevention Lifeline Crisis Center serving all of Kansas. We also take calls on a local number, 785-841-2345 providing emotional support for anyone who is struggling with any problem. It might be a mental health issue, grief, bullying, sexual assault, domestic abuse, addiction, or just having a bad day. We're here 24/7 to listen when you feel as though you have nowhere else to turn. By giving to Headquarters, you save lives. There's just no doubt. Most people considering suicide don't want to die; they struggle to find the hope to keep living. 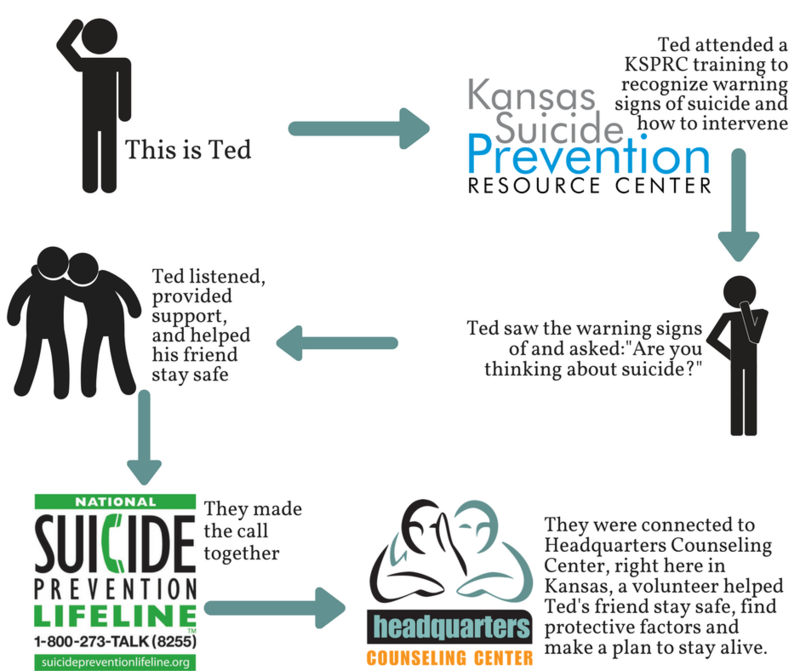 As Ted shows, Headquarters Inc helps prevention suicide through both of our programs. The Kansas Suicide Prevention Resource Center offers training, presentations, and resources within communities across the state to help better prepare our educators, pastors, businesses, government officials, and concerned community members spot the warning signs of suicide and know what to do to help that individual. Our commitment is to provide the best possible service to anyone who reaches out to us for emotional support. All calls are free and confidential. We've been credentialed by Contact USA, a national organization whose mission is to provide accreditation, leadership, support and networking opportunities to agencies and centers who offer helpline services to people in crisis via phone, and online emotional support services including chat and texting. We were honored in 2013 with the AAS Crisis Center Excellence Award. In 2015, we became accredited by ContactUSA for Online Emotional Support for our crisis chat program. We were also awarded the Student Union Activities Community Support Award in 2015 for our work with Kansas University students. A friend has lost a close relative to suicide recently. I'm giving in honor of my Dad's selected charity for Christmas! Thanks to Jordan and Kristen for their support of Headquarters. Thank you for being a beacon of hope for so many in Kansas! In honor of Miles' birthday, a generous 11-year old thinking of others.